This Island Course is Filled With Treasures! Description: Treasure Hunt Island is large designer pirate island adventure play inflatable that can accommodate 25 kids at a time, including 3 slides and many fun obstacles to run through. 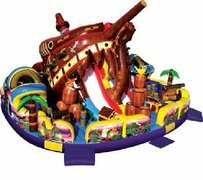 This unit has three sections Center Pirate Ship slide, and the two sides (form an Island Playland) can be used separately. This is a must have for every Buisness, Church, or School function.